Representatives call on Congress to focus funding for joint US-Israeli anti-missile defense programs and anti-tunnel project. US Representatives Grace Meng (D-NY) and Peter Roskam (R-IL) have called on Congress to reaffirm its commitment to funding cooperative defense programs between Israel and the United States. In a letter to the Chair and Ranking Member of the House Appropriations Subcommittee on Defense, the two called for 2017 funding to be focused on several cooperative programs with Israel. Specifically Roskam and Meng called to invest in the Arrow System Improvement Program (ASIP), designed to shoot down long-range ballistic missiles, as well as the Arrow-3 system which can target ballistic missiles outside the earth's atmosphere. 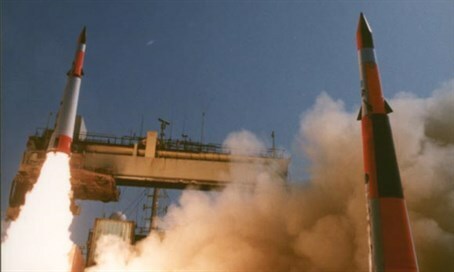 The David's Sling Weapon System (DSWS) intercepting short-range missiles, guided projectiles, cruise missiles, aircraft and drones was also mentioned in the letter, as was the Iron Dome short-range missile defense system. In a particularly timely call given Hamas' construction of its terror tunnels, the two also urged increased funding for the ongoing development of a new anti-tunneling defense program in a joint Israeli-American project. "Continued defense cooperation with Israel is critical," said Meng, a member of the House Foreign Affairs Committee and its Subcommittee on the Middle East. Roskam, who serves as Co-Chair of the GOP Israel Caucus, added, "US-Israel defense cooperation enhances Israel’s defense capability and ensures our armed forces have access to cutting edge, battle-proven missile defense technology." Meng and Roskam's joint letter follows their similar requests in 2014 and 2015, which led to increased support for Israel's missile defense systems.